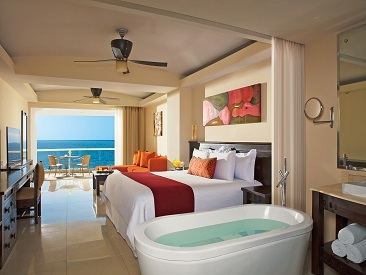 Dreams Villamagna Nuevo Vallarta is a tropical, all-suite, all-inclusive hideaway in beautiful Riviera Nayarit. Created to fulfill the needs of even the most selective travelers, this beachfront resort offers two 10-story towers with magnificent views of the Pacific Ocean and the Sierra Madre mountains. Dreams Villamagna provides lavish suite accommodations, an endless array of leisure and recreational opportunities and supervised Explorer's Club for kids. Guests enjoy gourmet dining and fun-filled bars and lounges, serving unlimited premium beverages; also featuring a full service spa, meeting facilities and other luxury amenities and services, Dreams Villamagna offers something for everyone. Discover Dreams Villamagna Nuevo Vallarta, an unrivaled tropical all-suite hideaway providing Unlimited-Luxury® for couples, friends and families on beautiful Banderas Bay. 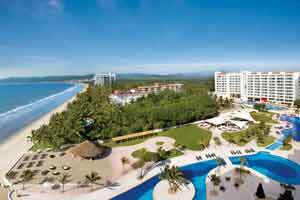 Created to fulfill the needs of the most discriminating travelers, this all-inclusive beachfront resort offers two 10-story towers with magnificent views of the Pacific Ocean and the Sierra Madre mountains. Dreams Villamagna provides lavish suite accommodations, an endless array of leisure and recreational opportunities and supervised Explorer's Club for kids. Guests enjoy true gourmet dining and fun-filled bars and lounges serving unlimited premium beverages plus a full service spa, meeting facilities and other luxury amenities and services. 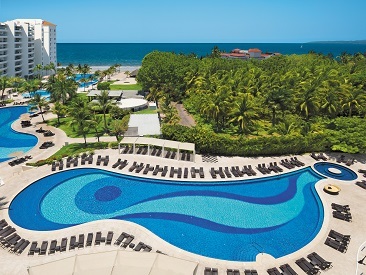 Dreams Villamagna’s elevated level of service, extensive array of amenities and refined, stylish accommodations has earned them the highly-recognized AAA Four Diamond Award. Perfectly located on the Riviera Nayarit's breathtaking Banderas Bay in Nuevo Vallarta, and just 5 minutes north of the Puerto Vallarta International Airport. Fascinating nearby attractions include the historic colonial town of Puerto Vallarta, whale watching, world famous fishing, championship golf courses and exciting shopping and nightlife. The exclusive 'Preferred Tower' offers a Concierge desk on each level. Guests enjoy access to private Preferred Club located on the penthouse floor including: private concierge; Club Lounge and buffet area withpremium liquors; premiere room service; upgraded mini-bar; complimentary internet access for laptops in suite/computer in lounge; hors d'oeuvres in the morning and afternoon. As part of the privileges of Unlimited-Luxury®, we’re offering guests of Dreams Villamagna Nuevo Vallarta the chance to Sip, Savor & See at the nearby Now Amber Puerto Vallarta. Enjoy dinner and live entertainment at neighboring resorts including sipping complimentary cocktails, savoring delicious cuisine at the restaurant of your choice and the opportunity to see that evening’s entertainment. Stay a minimum 4 nights over first anniversary date an receive 1 additional nights free. Restrictions/exclusions: Booking window is year round. Guests must have the authorized anniversary night certificate from the resort of their initial stay in order to receive the free anniversary night(s) which is earned when booking a qualifying wedding or honeymoon package (see individual packages for inclusions, restrictions, and room requirements). To be eligible for the free anniversary nights, guests must stay during their actual anniversary date. Anniversary nights must be redeemed at same resort brand as the initial stay. Marriage certificate must be provided upon arrival. Blackout dates and restrictions may apply. This promotion is not combinable with any other offers. Please note: These Resort Coupons may not be combinable with all promotions. Please ask your VE representative for more information. During select dates, AMResorts waives the single supplement for guests who wish to vacation on their own. Singles can travel and save at specific times of the year while avoiding paying the single supplement. Please note: No Single Supplement is non-combinable with: 3G and other Groups Promotions. Room Categories such as preferred club suites, presidential suites, or other categories that do not offer single supplement options are exempt from the promo. Experience Unlimited Connectivity and stay connected with friends and family while on vacation with the Dreams Resorts and Spas App.